Was over at High Street Fish And Chips for the first time last week after scoring some items from the William Ashley sale. While their signature Haddock was ordered, it was the Melton Mowbray pork pie that won my stomach. 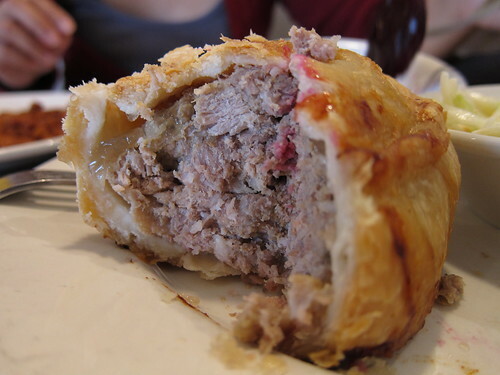 This traditional cold pie is a tall and fat puck of meat and subtle spices, cocooned in a thin pie shell. From first bite to last, it had a really clean and delicious pork flavour. I also very much enjoyed each mouthful with the cool layer of pork jelly – like a soft aspic – lining the inside of the pie wall. An optional side of pickled beets and coleslaw was offered as well, which I eagerly included. After so heartily enjoying my lunch, I lamented about not being in the area often ever these days, and thus unable to consume another pie soon. My sorrow was quickly assauged by the fact that they sold these pies to take home. So I grabbed two, along with a Cornish Pastie (which I liked less), and happily took my haul home. Hi David, I only wrote about it. You’ll probably want to try and contact the restaurant where they sell it and see if they would ship.